The Lilliputian world of the cryptic reef fauna guards its secrets carefully. Early this year what appears to be an undescribed species of Microbrotula, a miniature cuskeel, was collected at Eelskin, Aliwal Shoal by our ex Dive Supervisor and former Collection Manager, Andy Bentley. Andy has this thing about miniature fishes, and a rare clingfish was also literally attached to Andy on our dive at Ponta Milibangalala a few years ago. The genus Microbrotula is represented by two species from the Pacific; and there appear to be several undescribed species in the Indo-Pacific region. This 4 cm fish will be described as a new species next year by Dr Eric Anderson of SAIAB. 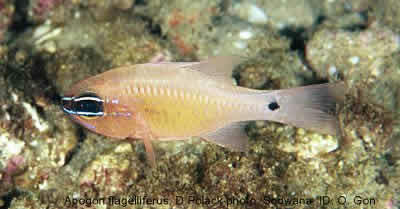 At Aliwal Shoal, we were fortunate to collect a specimen of an undescribed species of the sandperch genus Parapercis. This new species will be described with a Japanese colleague who is also working on this group. At the beginning of the year, Mark van Coller (photographer for Scuba Sodwana) sent us a scan of an unknown mimic filefish (Paraluteres) from Sodwana. We weren't sure what it was, so we forwarded it to the filefish expert in Australia, Barry Hutchins. Initially, Barry thought it might be Paraluteres arqat, a filefish previously thought to be a Red Sea endemic. 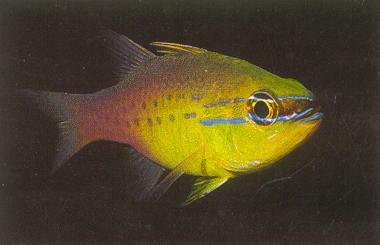 Then he got a specimen from Thailand with a photo showing its colour when freshly dead - it was identical to Mark's Sodwana fish. Another specimen of this species was also photographed at Sodwana by Dennis King. Filefishes of the genus Paraluteres are known as "mimic filefish" as they have developed colour patterns that resemble some of the sharpnose pufferfishes (genus Canthigaster). 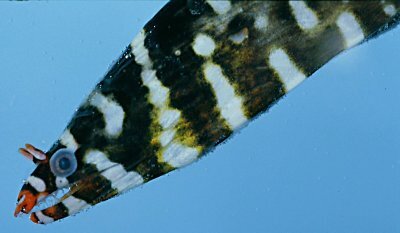 The best known example is the blacksaddle mimic, Paraluteres prionurus, which copies the black saddle colour pattern of the model sharpnose puffer Canthigaster valentini. The filefish looks very much like the blacksaddle toby, until you notice the long soft dorsal fin or the rudimentary dorsal-fin spine on the top of the head. In fact, when Dennis sent us his photo, he asked us to help him identify this "new Canthigaster". And we were flipping through our photos of Canthigaster, looking for a match for Dennis' photo, when it dawned on us that, "Hey, this is NOT a pufferfish, it's a filefish (Family Monacanthidae)!". This new mimic filefish, which has lots of pale spots, resembles the spotted sharpnose puffer, Canthigaster amboinensis, and the honeycomb sharpnose puffer, Canthigaster janthinoptera. Barry Hutchins is going to describe it as a new species of Paraluteres from the Thai specimen, with South African distribution records based on our 2 Fish-Watch members' photos. Neville Ayliffe from Reefteach at Sodwana has also seen this new Paraluteres. In September, we were privileged to host the Australian underwater photographer, Rudie Kuiter and his wife Alison, for two weeks in KZN for diving, fish watching, and underwater photography. Not only is Rudie a superb photographer, but he is also a very knowledgeable self-taught ichthyologist. It was enlightening to get Rudie's insight on our South African fish fauna based on his wide experience diving in Indonesia, Australia and the Maldives. While he was with us, Rudie photographed the male of the wrasse, Pseudocoris heteroptera, at the wreck of the Produce, Aliwal Shoal. We had no previous record of the male colouration for this species in the western Indian Ocean; and we have only 2 females (both from the Aliwal Shoal area) in our National Fish Collection. When we were at Sodwana in September, Fish-Watch member Dennis Polack pointed out that the mouth of the Natal fingerfin on our latest underwater worksheet didn't look quite right. Elaine was most embarrassed to find that Dennis was correct, and she has since improved her original painting. Please don't forget that this project is meant to be a reciprocal learning experience - and we welcome constructive criticism! Dennis was also helpful in sending us his lovely photo of the coachwhip cardinalfish, Apogon flagelliferus. So now we know the colour pattern of this rare endemic species. When we do our survey work in KZN we are required to follow Dept. of Labour regulations, which means we must have a minimum size team of scientific divers and a qualified dive supervisor. We have a symbiotic relationship with Bayworld in Port Elizabeth. Steve Warren, aquarist at Bayworld was our dive supervisor for this visit. He also was able to collect fish and starfishes for the Bayworld Aquarium. Gill Watson, Bayworld Collections Manager, joined us for the first time. Her job was to extract otoliths from the fishes we collected for the Bayworld otolith collection. Otoliths are the "ear bones" of fishes, and they are used for age and growth studies, as they show annular marks (like the growth rings on a tree stump) that can be used to determine the age of a fish. They are also very useful for studies of the diet of fishes, as they are the last item to be digested in the stomach of a predator. The otoliths have a distinctive shape, and when a large collection of otoliths from known species is assembled, it can be used to identify unknown otoliths from a predator's stomach. 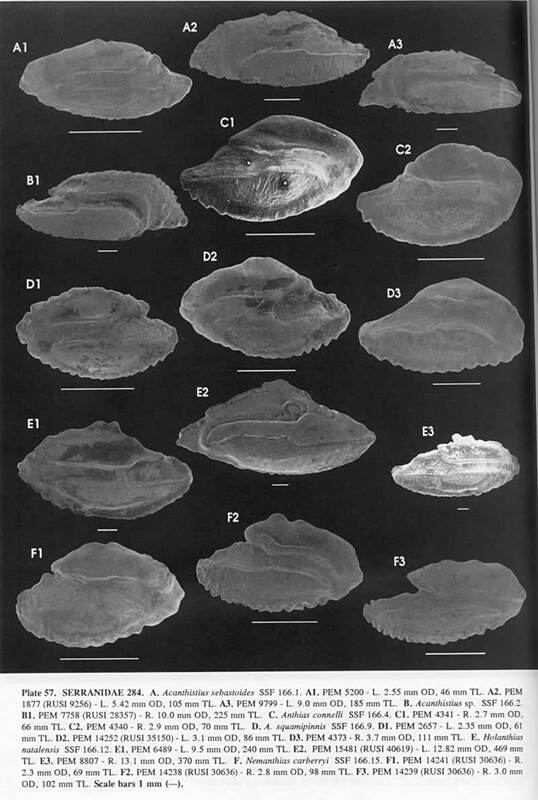 (If you would like to see some otoliths, click here to see a page from the Otolith Atlas of Southern African Marine Fishes by Malcolm Smale, Gillian Watson and Thomas Hecht. This page mainly features a number of small serranid fishes with which you might be familiar - the goldies.) Matt Dicken, a Ph. D student at Bayworld, also a scientific diver, helped collect fish and was able to make contacts for his research on the ecology and behaviour of ragged tooth sharks. Because of the research funding that Sappi gives Phil, we are able to continue our expensive survey work and help train students. HOT OFF THE PRESS!! On 14th November, 2002, Dave Smith's description of a new species of moray eel from Aliwal Shoal was published in the journal ZOOTAXA. Attached is a PDF (Adobe Acrobat) file of this paper if you want the details of this new species description. Dave Smith (who joined us briefly on a Fishwatch field trip last June) works in the Fish Division of the Smithsonian Institution in Washington D.C.. He is a world expert on marine eels and has written the texts for several eel families for the book on the fishes of the Western Indian Ocean that we are working on in Grahamstown. 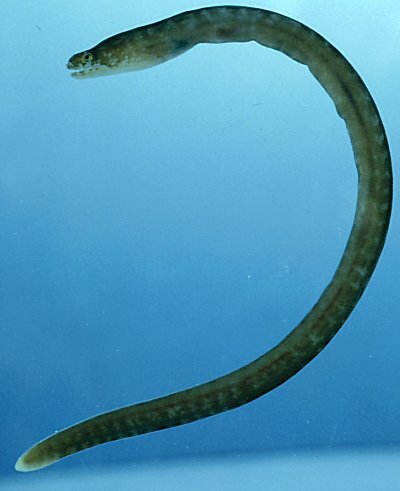 The type specimens of this new moray were collected on a dive off Hospital Road, Scottburgh in June 1994. This dive was one of a series of fish survey dives organised by Dr Colin Buxton (then with the Department of Ichthyology and Fisheries Science at Rhodes University) and Phil Heemstra. This new moray was named Enchelycore nycturanus. At present, moray eels with arched jaws that do not fully close (leaving some teeth exposed when the mouth is closed) are placed in the genus Enchelycore. The species name comes from the Greek nyktos (night) and ouranus (sky), in reference to the colour pattern of this species which resembles a field of stars on a dark sky. [Who said that scientists weren't romantic?]. 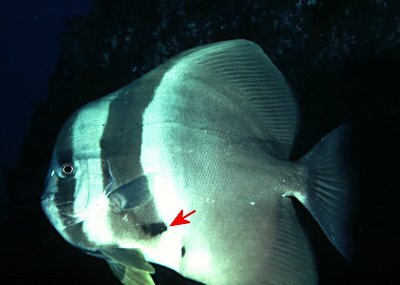 This species has about 3 irregular rows of white spots on the body and fins, and the spots become smaller, more numerous and more irregularly shaped on and near the head. On the throat and chin the white markings break up and join to form a pale background to small brownmarkings. This new moray might be confused with Gymnothorax eurostus, the salt and pepper moray, which also has white or pale yellow spots because some G. eurostus have slightly arched jaws that might leave a small gap when the mouth is closed. However G. eurostus usually has dark spots (the pepper of its common name) overlaying the white spots (salt). Gymnothorax meleagris, the guineafowl moray, is another white-spotted moray which might be mistaken for E. nycturanus. G. meleagris has more spots on the head than on the tail but it also has a black spot around the gill opening, has striking white mouthparts, and (if you ever get to see the whole eel) a distinctive white patch at the tip of the tail. The east coast of South Africa extends from near tropical conditions at its northern border into temperate waters at its southern tip. Dave Smith says that this area contains an extensive cool-water, continental habitat that has no equivalent elsewhere in the western Indian Ocean and that Enchelycore nycturanus may well be endemic to this area, whose fauna is just beginning to be revealed. The rare scorpion fish, Scorpaenopsis gilchristi was previously known from one specimen off Kosi Bay. 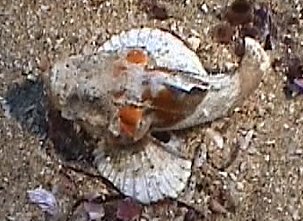 Thanks to the efforts of Fishwatch members, Lisa-Jane and Grant Hall, who sent us a photograph of an unusual little scorpaenoid fish from KZN, we were on the lookout for the same species. We collected 3 small scorpionfish and used the key to scorpaenoid fishes to arrive at an identification. However deficiencies in this key were revealed when the description of the species they keyed out to did not match the fish. So we worked backwards. Rudie Kuiter arrived at an identification of Scorpaenopsis gilchristi because the drawing of the species looked just like our specimens. The fin counts and other details (like head spines) in the S. gilchristi description also matched our specimens. Later, back in Grahamstown, several specimens of this supposedly rare species were found in the Fish Collection, misidentified as Scorpaena scrofa. We have changed the incorrect couplet in the key, so that mistake won't be in our next book. But we still don't know the identity of Lisa-Jane and Grant's scorpionfish! It has a large orange blotch on each gill cover, and head-on, this looks like two large eye-spots. While we were in KZN we joined well-known underwater fish photographer, Dennis King and nudibranch expert, Valda Fraser (who co-authored a recent book on southern African fishes and nudibranchs). Dennis wanted to show us one of his favourite dive spots, T-Barge between Umhlanga Rocks and Durban. We went out with Roux from Dive Nautique. Several longfin batfish, Platax teira, came up to meet us and escorted us down to the wreck. Despite the poor visibility that morning, we saw a huge shoal of small barracuda, a large bartail flathead, Platycephalus indicus, (or perhaps it was the undescribed species of flathead that is said to look like indicus - a species for photographers to target), kingfish, pineapple fishes (Monocentris japonicus), elf/shad (Pomatomus saltatrix), and many other species. Cameras were clicking nonstop! Bluespotted chromis Chromis dasygenys were busy building and guarding nests and had Elaine making notes on her slate to check whether she had painted the bright white spot on the caudal peduncle that disappears once the fish has died, and the white spot at the end of each lobe of the tails of juvenile specimens. We can recommend this site, there are so many species for fish-watchers to see! Our visits to Umkomaas are always enjoyable because of the friendly diving community we meet there. On this trip it was Reon and Karin Coetzee from Dive South, who invited us to share the potjiekos meal that they had prepared for a group of divers from the U.K. The visitors were in Umkomaas as part of the British DIVER Magazine Full Circle Expedition, which was on a tour of the World's top 10 dive sites. The U.K. visitors were very impressed with Aliwal Shoal, and by their dives earlier in the week at Gansbaai, diving with Great Whites and seals. One of the visitors was an avid fish-watcher, with a particular interest in butterflyfishes, and he spent a long time chatting to us about the local fish - and especially the butterflies he was seeing at Aliwal. 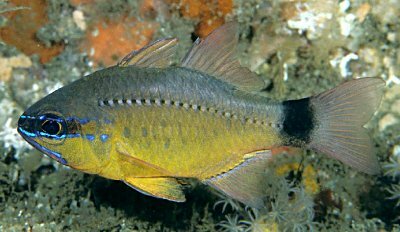 *Priolepis inhaca, the brick goby, was found at Aliwal Shoal. The identification of this minute goby was confirmed by Rick Winterbottom of the Royal Ontario Museum. This is a new record for South Africa; the species is known from the Indo-West Pacific region. *Trimma sp. On our last trip we collected 2 species of the small goby genus, Trimma from Eelskin, Aliwal Shoal. There are only two Trimma reported from South Africa in Smiths' Sea Fishes, SSF 240.101 Trimma flammeum, the flame goby, which we have photographed and SSF 240.100 Trimma corallinum for which we have no colour. We assumed we had one specimen of each species. 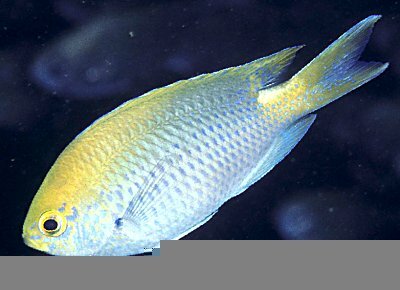 Only Trimma flammeum has been collected at Aliwal so the ‘corallinum' was a new record. On our return we used the new Trimma key for our forthcoming book on western Indian Ocean fishes to key out the ‘corallinum' specimen. 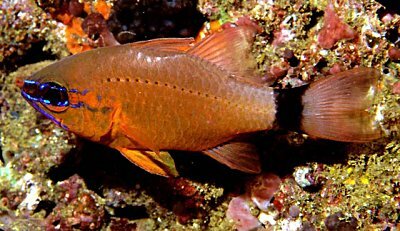 However it keyed out as Trimma omanensis, supposedly endemic to Oman! But the specimen also matched the description given for corallinum in Smith's. So either corallinum and omanensis are two names for the same species, or there is a mistake in the key and more detail is needed to differentiate these two species. We contacted the Trimma fundi, Rick Winterbottom at the Royal Ontario Museum in Canada, and he asked us to try and get samples of these Trimma for DNA analysis on our latest field trip. We had almost given up hope of finding any - but were relieved to get a couple of specimens during our last collection. We have posted the samples to Rick, and will let you know in due course the name of our new Trimma record for Aliwal Shoal. *Callogobius plumatus, the feather goby, previously known south to Durban; we collected it at Aliwal. In Randall et al, 1990 it says A. aureus has a sharply defined peduncular bar that resembles an hourglass. A. fleurieu has a less well defined [at the edges] bar that is not hourglass shape. If you have both species together, A. fleurieu has a slightly wider bar than A. aureus. Juveniles of A. aureus have a solid peduncular bar while A. fleurieu juveniles have a diffuse spot on the peduncle, as big as, or larger than the pupil. There are also differences in gill-raker counts and max. size [A. aureus appears to have a bigger max size 121mmSL; in a sample of 423 A. fleurieu only 28 exceeded 90mm SL, the max was 102mm SL]. Apogon fleurieu, Aliwal Shoal. Photo by Rudie Kuiter. Compare this species with the colour pattern of A. flagelliferus above. The most obvious difference is the size of the spot on the caudal peduncle. A. apogonoides is also quite similar to these fish, but can be distinguished by the lack of black markings on the caudal peduncle. Apogon aureus, Gulf of Oman. Photo by Richard Field. Compare this species with the colour pattern of A. fleurieu. The most obvious difference is the shape of the spot on the caudal peduncle. This species has an hourglass shaped bar on the caudal peduncle; A. fleurieu has a bar with straight, more diffused edges. *Fusigobius duospilus, the bare nape goby, was known to Sodwana, now collected at Aliwal. The duospilus refers to the 2 spots on this goby's first dorsal fin. 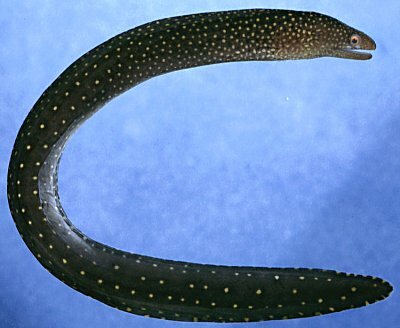 *Anarchias seychellensis, the marbled reef eel was known from Sodwana, now collected at Aliwal. Thanks to SAPPI who make the Fish-Watch Project possible. Thanks to Dennis and Sally Polack who make our visits to Sodwana possible and most enjoyable. Thanks to Ruth and Ginger Seipp for providing affordable and enjoyable accommodation and for putting up with our trying mob at Umkomaas. Thanks to Mark Addison and Pkee Stopforth for sharing their knowledge of Aliwal Shoal and its fish fauna. Thanks to Gerd Rahmer for helping us cope with a new level of bureaucracy. Thanks to Underwater World for access to divers. Thanks to Bayworld for the loan of a Dive Supervisor (Steve Warren) and Gil Watson (otolith extractor and hard worker).